The period between December 2017 and September 2018 saw much action from around Tasmania, with quad DQ class working on the Melba Line, and track machines on maintenance duties on the Western and South Line. In this production, we begin at Ross on a cold morning as 2 TR's running in "Elephant Style" work train 35 south to Brighton. 2 days later, we located on the Western Line as DQ's step in work freight trains between Devonport and Railton, and also to Western Junction. Moving into 2018, track machines TT7 and BR3 work around the regular cement train roster as track work continues ahead. We pay a visit to Herrick to see what is left of the former terminus of the North East Line from Launceston. 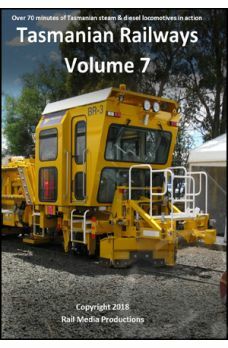 TasRail recently commissioned a track geometry testing wagon which would be coupled to a number of services around state. Throughout March and April 2018 we followed it on trains 36 and 34, plus the coal train on the Fingal Line. DQ 2001 makes a rare appearance at the head of train 36 as it works one of the last trains before the end of Daylight Saving. In April and early May we made 2 visits to the Bell Bay Line and followed train 34 out of East Tamar as far as Magazine Road on the climb from Cold Water Creek Junction. In early July we chased quad DQ class south on the Melba Line, and later we spent 3 days with steam locomotive M5 as it worked the regular shuttle trips as part of the annual Model Train Show.